The reduced vibration from the Air Motor and Gear driven system of the reciprocating air saw allow for a smoother, more comfortable cut. The SP Air Recipro Saw, No. SP-7610, designed with a swivel air inlet, rear air exhaust, air regulator, blade guide and safety lever is powerful enough to cut steel, FRP, rubber and resin objects such as bumpers. The SP-7610, 8.15″ in length, weighs 1.3 lbs and has an air consumption of 2.7 cfm and sound level of 86.5 dB. This motor-driven saw is designed with a 0.47″ stroke and operates at 5,300 strokes per minute. The SP-7610 is made in Japan. Ken Elzinga, owner of Byron Center, Mich,-based Hilltop Auto Service, found the SP Air Recipro Saw, No. SP-7610, to be capable of cutting through metal or plastic with great precision and ease. Elzinga employed the SP-7610 to cut out old brake lines in situations where he was unable to get the proper amount of leverage with a pair of dikes. He also used it to cut sheet metal for adding to the service body of a utility truck, and he found the saw to be “very helpful” for cutting out leaking A/C and heater hoses from vehicles, as a tubing saw was deemed to be too bulky to handle the job. The tool arrived in a small box with an extra blade included, says Elzinga. 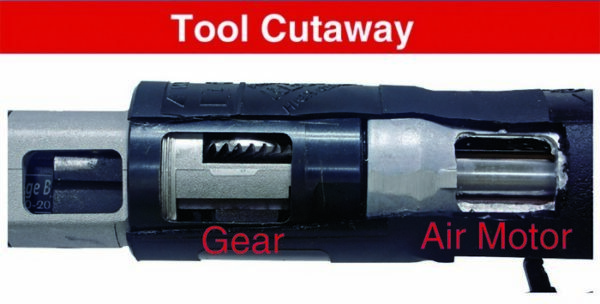 No set-up was required, and only an air fitting was needed to get the tool ready for use. As far as maintenance was concerned, all Elzinga did was add a bit of air tool oil each day before putting the tool to work. While he appreciated the performance of the tool, Elzinga says he wishes there were different styles of blades to cut plastic or thicker metals, and he thinks the SP-7610 should be about 1” shorter in length. “The overall length of the tool makes it a bit cumbersome in tight spaces,” he adds. However, Elzinga notes that the longer he’s had the tool at his disposal, the more uses he finds for it.